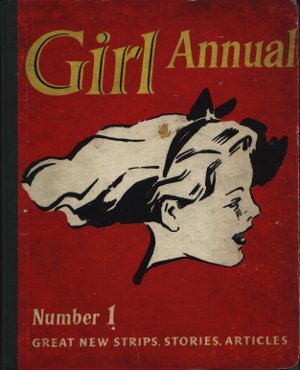 Girl Annual 1 was the first of the series of annuals for girls in parallel to the Eagle Annuals. Its content followed a similar style to the boys' annuals, with predictable gender stereotyping throughout. It has a good range of articles and stories, as can be seen from the contents list below. Even Harris Tweed makes an appearance. Dimensions : 21cm x 26.5cm with 174 pages. Got a nickname? Perhaps you can learn where it came from. Read about the A.T.A, the girl pilots who staggered even the R.A.F. REAL LIFE ADVENTURES 99 Girls of the A.T.A. 37 Is It Treasure or Treasure Trove? 71 A Continuity Girl takes you "On the Floor"
170 Do You Want to be an Air Hostess?